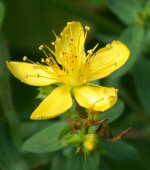 St. John's Wort is a perennial herb. It will grow to be 1-3' tall. 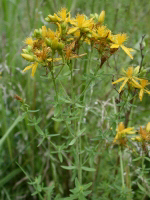 It has been introduced to many temperate areas of the world and grows wild in meadows mostly. Leaves: Leaves are oblong in shape and yellow-green in color. they have transparent dots and sometimes black dots on the lower surface. Flowers: It's 5 petaled yellow flower will apear at the ends of the upper branches between late spring and early to mid summer. Fruits & Seeds: There is a 3 celled capsule containing small dark brown seeds. Roots: Has a woody branched root system.